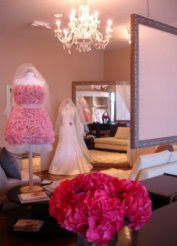 Something Blue is a lovely dress shop in Las Vegas where brides are treated to a VIP private party experience while shopping for their dream gown. Champagne and hors d'oeuvres are served while you enjoy a relaxing experience. Something Blue is currently offering sample gowns at 50% off. Check out their myspace page for photos of sample gowns! Tracey of Las Vegas Wedding Concierge featured in Bride and Bloom!